[A] [(V)] MVP: [Soulblast: (1)] When this hits a Vanguard with an attack, you may pay cost. If so, look at the top card of your Library and put it either on top or bottom of the Library, and draw a card. 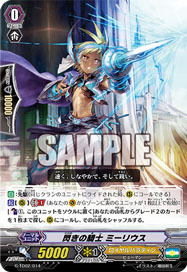 [A] [(V)]: [Counterblast: (1)] When your Rearguard with MVP ability attacks a Vanguard, you may pay cost. If so, that unit gains +3000 Power for the battle.